Battle Chef Brigade was one of many games confirmed for the Switch eShop back when the console launched, but Nintendo has now taken the opportunity to share more of it in today's Nindie Showcase. Developed by Trinket Games and published by Adult Swim, it's a fantastical setting that mixes up combat with match-three play; we'll let the description and trailer clarify matters further. Orcs, elves and humans have one thing in common – a need to feed! Battle Chef Brigade is one part combo-based action game, one part match-three puzzler and an all-around feast for fans of 2D animation. Do you reckon this'll be a tasty game for the Switch eShop? It's due in the Holiday season. I remember hearing about this a while back. It sounds great on paper, hoping to see more gameplay. I always wish for Namco would make a game like this and star their mysterious wonder chef from their Tales of games. Looks like this one would had to do, a game where you can actually do all the cooking seems very cool. I really don't know what to make from this. Guess it's not for me, then. But aside from my own opinion, it's good that so many titles are coming to the Switch, indie or not. The more the merrier and the better. 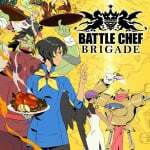 http://www.battlechefbrigade.com/ makes the game looks pretty good. Not sold on it yet but I'll be watching this. Hoping for a demo. This game look so haphazardly thrown together and not fun. I knew about this game some week or two prior to this trailer and the gameplay for it looked so addictive! Match three puzzle games have never really appealed to me but then add the 2D platform action aspect and suddenly I'm listening! I think this is the type of game that I give a chance based on concept. Of course I will need a demo and to see what pricing looks like. The art isn't really selling it, and the concept of making food in a video is strange to me. Maybe Cooking Mama fans will like this? This looks pretty good. I thought it would be one of the games I'd not care for. Funny how a trailer can change your mind, it's almost like that's what the person putting together the trailer wanted, to convince people that their company's game looks good. This game looks so damn good, i hope its finally on the way. Don't know if its something for me, but at least it looks original.